Picture postcards with Halloween greetings began to appear in the early 1900s. They range from simple cards with "Happy Halloween" to elaborate embossed and multicolored cards with gilt trim. Some collectors look for Halloween postcards featuring a particular subject — witches, pumpkins, black cats, children playing games or children being frightened. Some like "mechanical" cards with moving parts. And still others favor cards by a favorite illustrator or publisher. 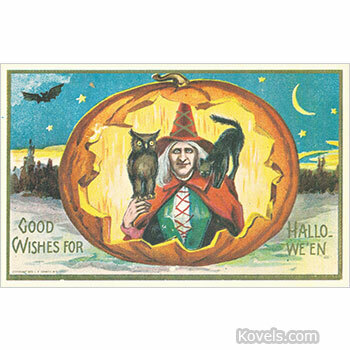 This postcard has it all – a witch, an owl, a black cat, a bat and a big pumpkin. It’s from about 1919 and is worth $10. The card has a "divided back," with space for an address on the right and space for a message on the left and the postage was 1 cent. Find more Halloween collectibles and prices in the online price guide at Kovels.com, and in our newest book, Kovels' Antiques & Collectibles Price Guide 2019, available in bookstores and Kovels.com now. Wishing you a safe, happy and slightly spooky Halloween!